What do you crave? Chocolate perhaps tops my craving chart; ice cream might head my husband’s crave list. Cravings are attached to desire rather than need. 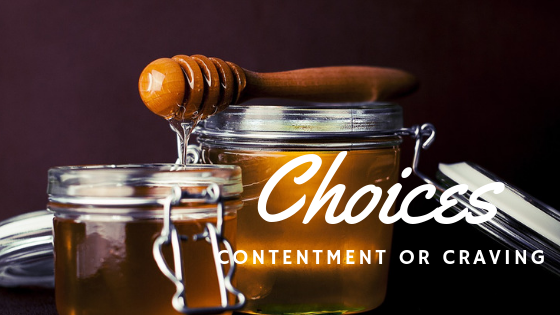 Learning the secret of contentment requires wisdom to know the difference. God often gets my attention through simple everyday activities. Recently, I was reminded of just such an incident that occurred several years ago. A mature cow delivered a healthy black calf on a fine spring day. In inexplicable rage she immediately attempted to kill it! I’m not exaggerating! Her whole intention was the destruction of her newborn baby. After rescuing the little one, we put them into the calving barn to give opportunity to “mother up”. However, every brain cell she possessed seemed to collide with that notion! Several times a day for the next three days, the only way her baby was able to nurse was to confine this stubborn cow in a squeeze chute to prevent her from either kicking or bunting her beautiful baby to death. Ouch! God’s word hit the target! I knelt in the fresh straw, acknowledging my own foolish stubbornness, as I sought God’s forgiveness through repentance. Almost simultaneously, the cow in front of me seemed to have an equally profound change of heart. She began to nuzzle her baby, mooing softly and gently to her little one. Tears ran unrestrained down my cheeks as I realized God was willing to use this not-so-spiritual barn and animals to speak truth regarding my misaligned heart attitude. It had been a couple of years since the Israelites had escaped Egypt. Any positive inclination they may have had was fading fast. I have an extremely low tolerance for grumbling — unless, of course, if it is me doing the complaining. Don’t get me wrong! I’m quite “Christian” about it! It starts as mild discontent, a touch of cynicism, a pinch of fussing, a bit of criticism here and a little grievance there. If left unchecked, however, the petty picking multiplies rapidly and exponentially. “If only we had meat to eat! The craving of a few spread like deadly gangrene infecting the entire camp. wailing at the entrance to their tents. Unchecked internal grumbling will soon push its way to the surface, rising like a volcanic explosion spewing toxic debris everywhere and on everyone! Notice the difference between the Lord’s and Moses’ perspective — The One angry, the other troubled. God was the One who heard their groaning, responded to their cries, and provided supernatural rescue. Today, these complainers lacked nothing! He was, and still is, the LORD who Provides! Daily God covered them with a cloud of protection, shielding them from the desert heat. He, Himself, was their night light, a pillar of fire, warding off imposing darkness. That’s not all! What more could they need? Nothing! What more did they want? Everything! Moses heard their words; God saw their heart. They weren’t just asking for food; they were demanding better! For them it was fish, cucumbers, melons, leeks, onions and garlic. What do I crave? Craving is attractive to the eyes, creating a desire for or greed after. Sometimes God reluctantly allows us to taste the fruit of our cravings. The Lord gave them what they craved. and he struck them with a severe plague. God promises to give us the desires of our heart. Unfortunately, this includes both good and evil! It would be wise to examine carefully our desires so that out of the good desires of our heart we will reap only blessing. Kibroth Hattaavah means “graves of craving”. Just in case you are thinking, God’s love, generosity, and grace are greater this side of the cross, let us consider carefully the present day price tag on humanities insatiable appetite for more and better. Heart disease, the number one killer world wide, is often the result of improper eating habits — a quest for more than what is needed. Many deaths are indirectly attributed to stress; stress we willing assume in pursuit of “bigger and better”. The killer of HIV/AIDS would be non-existent to a people content within the marriage union. Millions more die through wars, conflict and terrorism — the craving for power, wealth or land. This year alone, 40,000,000 lives have been terminated via abortion, the choice available to a culture craving something other than life! Substituting cravings for contentment brings health and wholeness into our lives spiritually, physically, emotionally and relationally. Ceasing grumbling isn’t enough! Walking step-by-step in contentment is necessary and so much better! Perhaps even the best of all! Contentment is one indeed of God’s great gifts available to us now. Second is Better Than First! When Second is Best! Thanks, Maryann, I just read this blog entry and it comes at a time when I needed to hear it. It is not difficult to imagine myself as the cow, rejecting her perfect calf. God knows what we need, and so help us when we try to walk away from what he has placed before us. All the best, and keep on writing!